Yesterday was a happy day. A very happy day. One of my best friends, Kemanthi, renounced all worldly things and took a huge step in becoming a Buddhist bhikshuni. 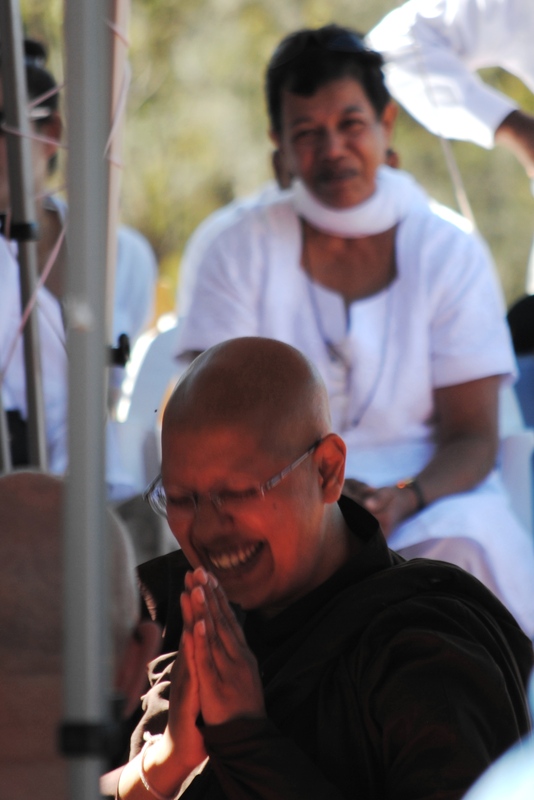 As part of the renunciation, she gave up her lay name and going forth will be known as Karunika. A name befitting her in any day. It was a really a joyous occasion and I was elated to be there. Words can’t express how happy I am about the journey samaneri Karunika is embarking on. We don’t always agree on religion and philosophy, but her bravery in doing this is remarkable. I wish her full speed ahead toward finding true liberation of nirvana. Note on pic: I wanted a bit more depth of field in this pic, but unfortunately this was the best I could do. Well, next time…. Oh wait, I don’t think anyone else I know will be getting ordained anytime soon. Lovely. Wish I could have been there. I am trying to get exact location of this center. Would you be able to help in getting me the location or contact details for this center ? Two of our Bikkhunis from the Dhammasara Nuns monastery (Venerable Nirodha and Venrable Hasapanya) are coming to Sri Lanka next week, on 1 November 2011. They will be accompanied by a samaneri to be ordained this weekend, (currently Dr. Khemanthi Nandasena) and a lay supporter Mrs. Ber Sun. They have been offered a sapling of the Sri Maha Bodhi by most venerable Atamasthanadhipathi in Anuradhapura to be planted in the monastery in Perth. There will be a function etc in Anuradhapura on 4 November to mark this event. I undertsand that the Atamasthanidhipathi was moved after finding that Dhammasara is the largest Theravada monastery at the moment for nuns outside traditional Buddhist countries, and made this offer. They have also been invited to visit the Dalada Maligawa and will be in Kandy from 2 to 3 November. From Anuradhapura they will travel to Colombo on 6 November. In Colombo Venerable sister Nirodha is conducting some teachings at Dhammaruwan’s Nirodha Trust meditation centre. Ven Nirodha will also officially open this new centre in Mirihana. Dhammaruwan was supported by her during her lay life and spent some time in Sri Lanka learing and teaching meditation. She is originally from Austria and now the co-abbot at Dhammasara monastery after Ajahn Vayama retired due to illness. I am letting you all know in case any of you can find the time to particpate, learn and rejoice through particpation in any of these events. They are happy to accept any help and support and asked me to pass the message to the Ajahn Brahm Society’s active group of members. Please let me know if you would like any more information or want me to let them know your availability to help tehm in any way. Sorry it is short notice and a quick rough email as it was all arranged in a hurry. Please pass on to any others who may be interested.